LineBacker® sealing gaskets use a rectangular sealing element, referred to as a "quad" ring, in combination with a unique groove design to effectively seal and isolate flanges of all types. With the unique quad ring design, elastic memory is provided for elastomers not normally associated with this characteristic. 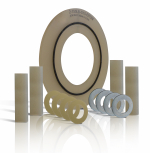 Materials such as PTFE may therefore be used as sealing elements, dramatically increasing the ability to match gasket materials to service conditions. This greater variety of materials also provides excellent temperature and chemical range compatibility. LineBacker® sealing gaskets are self-energizing with theoretical near-zero "m" and "y" factors resulting in a positive seal without excessive bolt loads - as are often required with flat gaskets. One isolating and sealing gasket, LineBacker® Type E or F, .125’ thick manufactured with a G-10 fiber glass reinforced laminate carrier containing a groove with incline plane. Groove will have correct volume void ratio to accommodate seal compression. Sealing element shall be a square elastomer or o-ring. The G-10 retainer shall have a 800 volts/mil dielectric strength and a minimum 65,000 psi compressive strength. The I.D. of the flange isolating gasket shall match the bore of the flange in which it is installed. All ANSI rated flanges to 900#/3,000psi respectively. Maximum hydrotest pressure is 3,350psi and maximum operating pressure is 2,225psi. The LineBacker™ series also performs well in vacuum service. The LineBacker™ is an excellent choice for isolating distribution lines and transport lines for gas, oil and water. The screened version is the best available product for filtering welding slag, rocks, nuts, bolts and other particulates from traveling downstream and damaging valves, pumps, compressors, etc. Because the LineBacker™ has near zero creep relaxation, it performs well in heat exchangers, applications with high vibration or excessive thermal cycling. Before Tightening The flange faces come into contact with the sealing elements, which extend slightly above the surface of the retainer. As the flange is tightened, the sealing elements are compressed and move sideways into the inclined portion of the groove, developing a high unit pressure against the flange faces. After Tightening The flange faces have come into firm contact with the retainer, thus encapsulating the sealing elements within grooves. At the same time, the unique LineBacker® seal configuration provides elastic memory for elastomers not normally associated with this characteristic — resulting in a simple flat gasket with extremely high-loading and self-energizing characteristics without adverse cold flow problems. The LineBacker™ is one of the few gaskets with virtually zero creep relaxation. Isolating gaskets may be specified as either "E" or "F" type while single, double or one-piece sleeve and washer sets are offered as options for varying degrees of electrical isolation between the flanges. A wide variety of material options exist for both isolating gaskets and sleeve and washer materials. All kits are correctly sized for the application and conveniently packaged to minimize loss of component parts during installation. Type E Gasket (Full Face) The gasket retainer extends out to the O.D. of the flange. Holes are cut at the bolt circle to accommodate threaded studs or bolts. Type F Gasket(Ring Type) The gasket retainer extends out to the I.D. of the bolt circle. The bolts center the gasket in the flange. In buried applications, single washer configurations may be used to allow the Cathodic Protection (CP) current to reach the nuts and bolts. If desired, nuts on the opposite side of the cathodically protected flange may be included as part of the protected system. Double washer configurations may be used for added protection against the possibility of "shorting out" the nuts and bolts. In addition, double washer sets electrically isolate the nuts and bolts from both flanges. Easier to install, one-piece sleeves also allow the inspector a visual indication of sleeve usage. Due to the relatively low compressive strength of this material, its use is not recommended for high pressure or large diameter flanges that require high torque loads. Note: G-10 One-Piece sleeve/washer assembly available for additional strength and convenience. The GPT LineBacker® gasket is considered to be one of best methods for ensuring zero environmental leakage for almost any type of fluid.